When I was at perhaps my lowest ebb, in the mid 1990s, these words fell out of a book and landed at my feet. The words telling me not to be disturbed and affrighted pierced the fog in which I was living, and I remember holding onto the prayer and thinking that I had just received some divine consolation. I was being told not to be afraid, and at that time I was very afraid. I took from this prayer whichever line that I needed at the moment of reading it, to help me through the next few years. Sometimes I was being told that all things were passing. I would not be like this forever, this would pass. Sometimes I went back to the lines that told me not to let anything make me afraid, and sometimes I wanted to know that God never changed. I couldn't be dismissed nor be passed over by God just because I was not in control of my life and was making some very bad decisions. And sometimes I wanted to hear that patient endurance attaineth to all things. If I kept going, trying to find the light at the end of the tunnel, then I would get there. Sometimes I fitted my life and circumstances into the entire prayer, and found that the whole thing told me I would not be like this for ever. There was a day coming when it would be in the past, and I would not feel so low. There was more to life than this. I was divorcing my first husband. I had three tiny children, one of whom was under a year old, no income, and was having to protect myself during a difficult divorce. I had to find an income, quickly, I had to find a way to get all of the children to schools and back, to feed us all, to pay all the bills and the mortgage, and I had to deal with the legacy of having been married to, amongst other things, a very heavy drinker. I was also about five stone overweight. I think I was very afraid, of everything and everyone. And I felt so helpless. 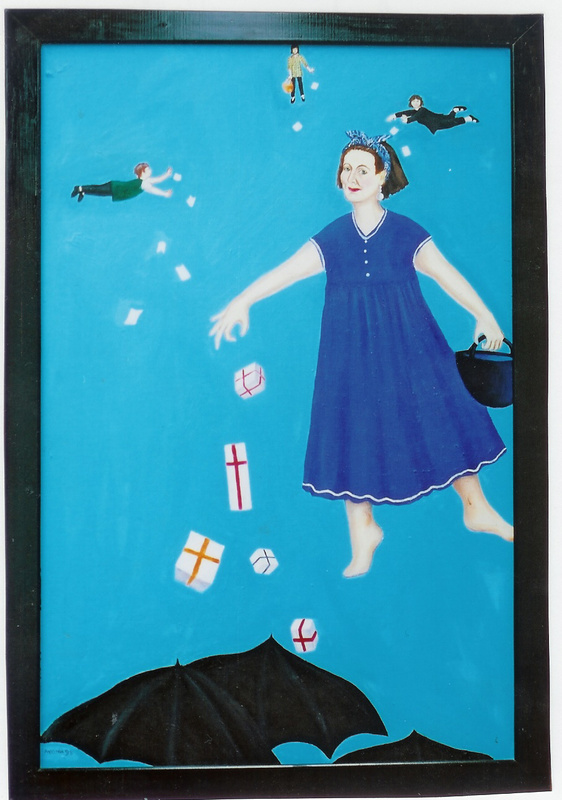 Throwing Away My Troubles, about 24"x 18"
A very large me is floating in a bright and cloudless sky and dropping her troubles out of her basket onto the world below. Because I didn't want anyone else to be knocked on the head with them, I have given them umbrellas so that they are protected below. Flying in the sky behind me, far above and getting rid of their own troubles, are my dearest friends from University days - Eileen Rafferty, Tasha Yarker McKenzie and Rhona Reedie. What I wanted to say in this painting was that I was not completely overtaken by events, and that I could see a way to keep myself sane, and that I was not alone. It is a gentle and special painting. It was painted in a time of great turbulence and yet I am looking out at you with a wry look on my face. And I make eye contact with you. I know how I look, I know how things are, and I am still able to float up into a wonderful blue sky, far above you all, and throw all my troubles, nicely packaged, out of my basket. And, just to prove that I am not alone, my friends are doing exactly the same thing in the same sky, just there in the distance. At this difficult time, I had found a room in an old abandoned office block near to where one of my brothers was working, and I had set up a studio in there for very little rent. It was a strange place, and it was to this studio that I escaped whenever I could. I painted the above painting, Throwing Away My Troubles, in there. From the abandoned office block came another painting, Fat Ladies Diving. I painted this as a means of sheer escapism. This was only a small painting, but it made me very happy. 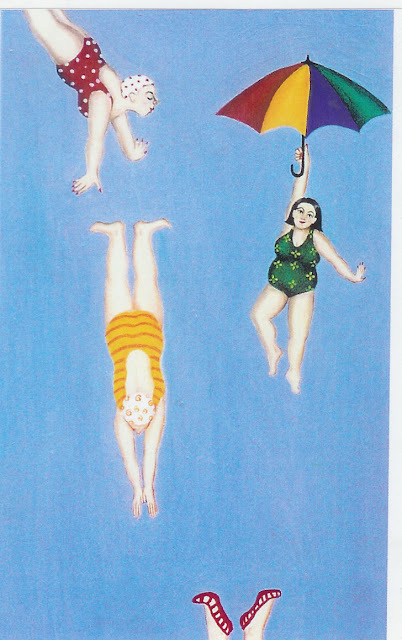 I would paint fat ladies, like myself, diving carefree and lovely, in matching swim suits and hats, through the sky and not paint any water or any suggestion of anything that they are diving into. We would live in the sky. We would dive forever in the bright blue of this happy sky. It was a good way of escaping the madness of my daily living at that time. The Floating Franckes, Oil on wood, 24" x 24"
Bliss! What brave people! Here is Donald and Margaret Francke, wanting to be painted falling joyfully through the sky with their two beloved dogs. Margaret, an opera singer, is dressed in her finery and has a bouquet of roses falling with her. She carries a lovely parasol to help her float with grace while Donald, an actor and singer, had chosen to wear a Victorian bathing costume and hold his beloved anemometer. Donald is fascinated by science and wanted to hold at least one of his collection of scientific instruments. Below Donald is the planet Saturn. Another of his interests is astronomy. These two venerable people came my way and this is what we came up with. I did a number of portraits of people floating in the sky after this, and found that quite a few people wanted to escape up there, it was not just me. Marathon Madonna. Her time is spookily the same time as mine. Mary, the Mother of Jesus, or as she is known, the Madonna, is running the London Marathon. This is at the finishing line, and though everyone else seems to be running past the line with aplomb, the Madonna is barley able to stagger her way past it. We all had our names on our vests, and she has Mad 1 on hers. Her hair is straggling under her headdress, she is really very exhausted. I remember staggering past the finishing line straight into the arms of my mother and my older brother Ralph. It was pouring with cold rain, and all I could think of was cheese sandwiches. The Madonna is more sophisticated, I have not painted that into her experience. I will end this section of my life through my art with this Santa Croce Yacht Club. I look back on that time, fifteen or so years ago, without much pleasure, but I did always continue to paint. It gave me an escape and an escape was just what I needed. I was finding out what I could paint, what I wanted to paint, and what I was being asked to paint. All of this was very valuable, and I began to make sense of my new life on my own. I began to make my way back to health with my weight loss and I began to make friends through painting and taking on commissions. It was a long slow journey, and I am glad that that particular part of it is over. This is where it all began. Look at this painting and notice what you are feeling. Really look at it, give yourself time, and look. I love this painting with a passion. I am very affected by it, I feel the power of this image and never get tired of looking at it. Here is what happened. When I was eight years old, I was a very established fairy. Fine. I wore net curtains and a home made crown, and because my Aunt Kit had tiny feet, I wore her shoes. I loved to draw, to paint, to make lovely things and I had a vivid imagination. I lived in an imaginary world. My father always noticed and encouraged me, and being artistic himself, being intellectual, well read, and slightly eccentric, he selected this painting in a book one day and asked me to come and look at it. Here, he said, is beauty. Look at the faces, he said. 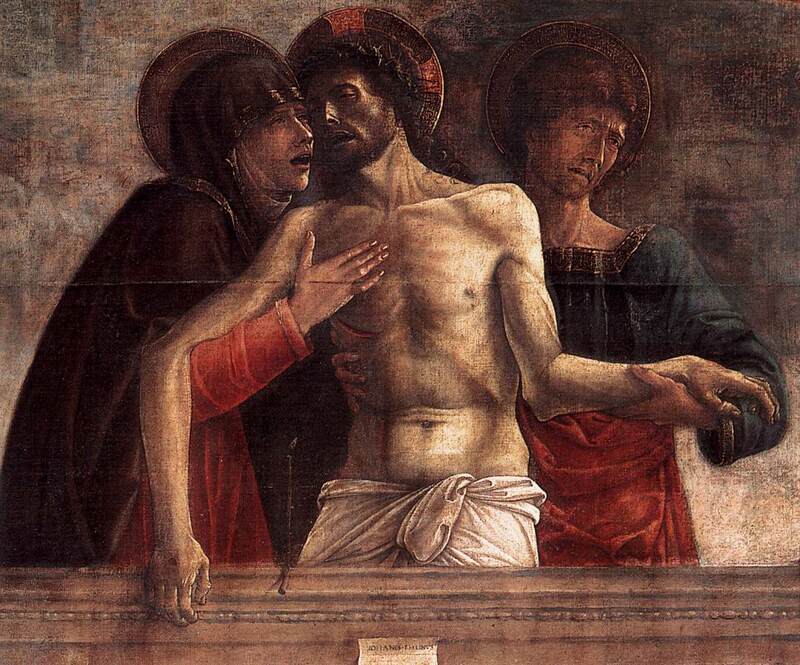 This is the dead Jesus being held by his mother. Look at how their faces turn to each other, see how Mary has only eyes for her son, how Jesus turns his head towards his mother's face, see how she holds his hand. The light is white, and falling on the figures giving them shape, said my father, and see - there is a quality of silence and pain in this scene. How beautiful are the hands? How beautiful are the folds of the clothes? And can you imagine what St John is feeling as he holds Jesus and looks away in shock? Maybe Giovanni Bellini painted these faces from looking at people around him. This painting, said my father, was painted in about 1460. 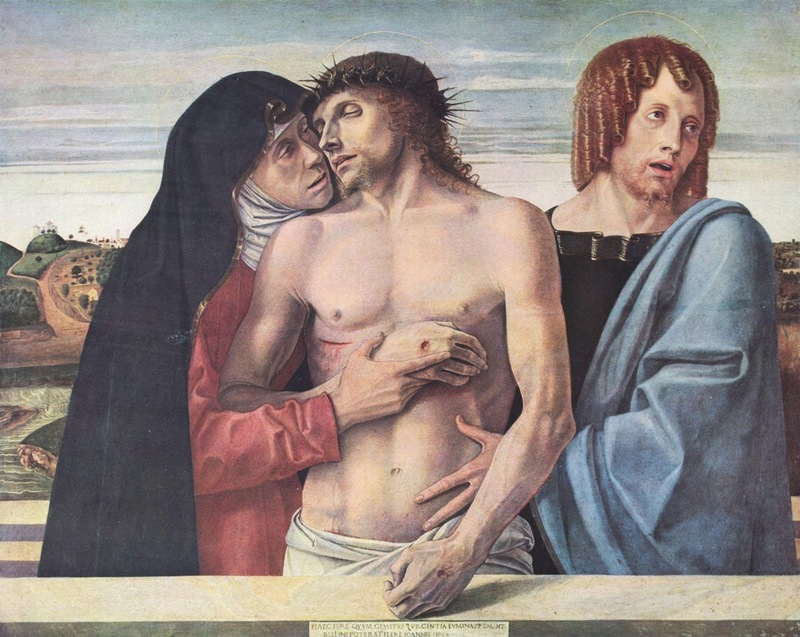 Maybe these were faces that went to the market, that walked in the street, that got on with their lives in 1460, and you, said my father, are seeing them today in this painting of Jesus being held by his mother and St John after his ordeal on the cross. It was a moment of recognition for me. This is what painters did. This is what I would do. I kept this painting and looked at it often, falling in love with it again and again. How could a man from so long ago paint something so moving, so exquisite, so painful? How could he get the eyes so real? The hands so amazing? How did he paint the quality of silence and stillness, how did he seem to capture an intimate, powerful, private, moment that we should not be seeing? And yet we were there, with them, watching with horror the moment a mother holds her dead son. I wanted more than anything to do this, to paint something that was as beautiful as this. At University many years later, my dissertation was on the religious frescoes of Pietro Annigoni. I wanted to talk about his recent, currently being painted, religious frescoes, and I went to Florence to track him down. I did track him down, and he did help me wonderfully and I was bowled over by his work. So bowled over that I couldn't speak. It was with huge difficulty that I communicated at all, it was as if I had an audience with a rock star, I was so overwhelmed. He was a very kind man, and seemed to be used to paralysed students, he asked himself questions and then answered them for me, and I wrote it all down. I went and visited, with special permission, the frescoes that Annigoni was currently painting. I went to Monte Cassino and to Padua, and I can't remember where else. I did not see him at work, but I saw how it was done. The scaffolding, the paints, the drapes, the brushes, the paraphernalia accompanying him as he created his great art on the walls of churches and Cathedrals. And the paintings themselves. Lord, they were magnificent. Goodness, they were powerful. So beautiful, so intense, so passionate. And all these religious scenes, painted by a man who was an Atheist. I had not come across that before, how could a man who didn't believe in God paint such glorious religious paintings in a church? I thought I saw evidence of a struggle in the frescoes. I thought I caught a glimpse of the powerful inner life of an artist, I thought I understood a little more how magnificently contradictory an artist could be. I'll be that one day, I thought. If only I could speak. 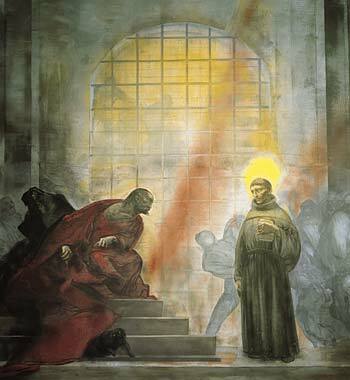 Here is St Anthony meeting the tyrant Ezzelino da Romano, painted in 1981. I was there in 1981 and stood in front of this before it was finished, feeling the energy in it, the menace of Ezzelino and the figures in the background, feeling the passion of the artist and thinking of the Atheist who painted this insightful and beautiful fresco. The dog is very ugly, it highlights the saintliness of Anthony as he stands, still and vulnerable, before the threatening figure of Ezzelino da Romano. The painting is full of movement; controlled, big movements, with the still, silent, glowing figure of St Anthony in the centre of it all. What I saw, when I met Annigoni, was a modern day embodiment of Giovanni Bellini. Both were Italian, both painted with power, magic, brilliance, and I felt a link between them from over the centuries. I was in awe of Annigoni because he not only represented his own art, but because he represented the painting that first moved me to a place quite beyond myself when I was so young. I could have been in the studio with Bellini. Bellini lived in Venice, Annigoni lived in Florence, and I was there, in Italy, the country from which both men came, and even though I have not a drop of Italian blood, I do at least have an Italian name. I am in no way like Bellini and Annigoni. But I am looking for a way to represent very powerful human stories through art, I am deeply affected by the way in which they interpreted the scenes they were painting. 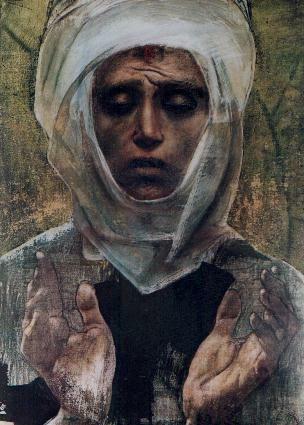 I am moved each time I see work by Bellini and Annigoni. I feel that they are painting from their hearts, there is something far more to what they produce than simply a picture. When I paint for the A Graceful Death exhibition, I remember the power of these two great painters. I am moved beyond imagining by the people that I paint for the exhibition, and hope to go beyond mere representation. I want to say something much more about the situation that my sitters are in, I want that magic from the other place, that Annigoni and Bellini access, to come to me. There is real love in what they do, and real love in what I do. Another Pieta, by Giovanni Bellini, from about 1472. This is a detail from a larger painting. like this one. The Steve as Christ's Head painting is directly inspired by paintings such as these. I have taken a dead man and given him the same love in paint as in the painting above, I have given him a golden halo and used the darkest of blues to highlight his yellow skin and I have tried to give the painting something from that other place, that Bellini, Annigoni and other painters can access. Here is another example, of painting with love. Anne Snell here is sitting with her husband Peter as he dies, and holds him with both her hands. I did not paint it here, but her other hand was under his pillow holding him close to her. Their faces are close together, they are connected in this painful and intimate moment, and we feel that we are watching something private and deeply moving. And of course, we are. Annigoni's drawing is excellent, in all his works, the evidence of perfect drawing is there. I have tried to make the drawing correct in the painting above (and in all my paintings) and have worked hard to make it all as good as I can. So now. I want to leave you with an exquisite drawing by Annigoni. Can you see the movement in the drawing, feel the restless energy with which he must have drawn this face, are you inspired by the beauty of the image? What a lovely way to end this blog. With a drawing by Pietro Annigoni. We began with Bellini, we end with Annigoni. Oh I am in such good hands. I am illustrating a new children's book about a little girl witch and her poodle dog. I have created the character, and have given her lovely rosy cheeks and masses of auburn curls. It has been great fun making her, and painting the woodlands in which she lives. I have been allowed to wander into an enchanted world with this little girl witch, and feel as if I am enchanted too. She wears red doc martens boots. In the studio, I speak to this little girl character and ask her to come and reveal herself, and to help me to paint where she lives. All very much in keeping with the idea that the creative force comes from outside, and is divine. It is not you who owns your gift. It is given to you from above. Or beyond. You are lucky that it speaks to you, and that you are able to receive it. The ancients called it your Genius, but it was not living in you making you a genius, so no false pride and conceit there. Nope. Not you at all, so man up is the advice given, and be nice to your gift which chooses you, not you it. You ask for it to come and inspire you. I have taken this idea on board with gusto, and find it an enormous relief not to have to be responsible for the paintings that I do. I sit there, prepared to do the work, and yell for the divine creative thing to come and inspire me. Thanks very much, I say afterwards, when it works. You were fab. And if it doesn't work, I say, well. You weren't much help today. And then I remember it chooses me not I it, and say with a placatory and winning smile - perhaps I wasn't listening properly! Not your fault! Thank you very much, please, and thank you (in case the divine muse has feelings and can sulk if I am not polite). I have had an idea about the funding. I will ask for sponsorship from charities, companies, individuals for each individual painting. If I am working with someone who has cancer, for example, which I do a lot, then I will apply to a cancer charity to fund the painting. I will ask for help painting by painting. How about that for a simple idea? I am very excited about the possibilities this creates, and perhaps a link with appropriate charities will be good for me and a link with an artistic project that highlights, with love and clarity, how normal and human it is to die, will be good for the charity. Or individual. Or company. I don't want to stand in your way, any of you. I am delighted to be working with two new people in January, both of whom have Motor Neuron Disease. This will be my first experience with MND, and I am looking forward to learning about it through the people I will be painting and interviewing. 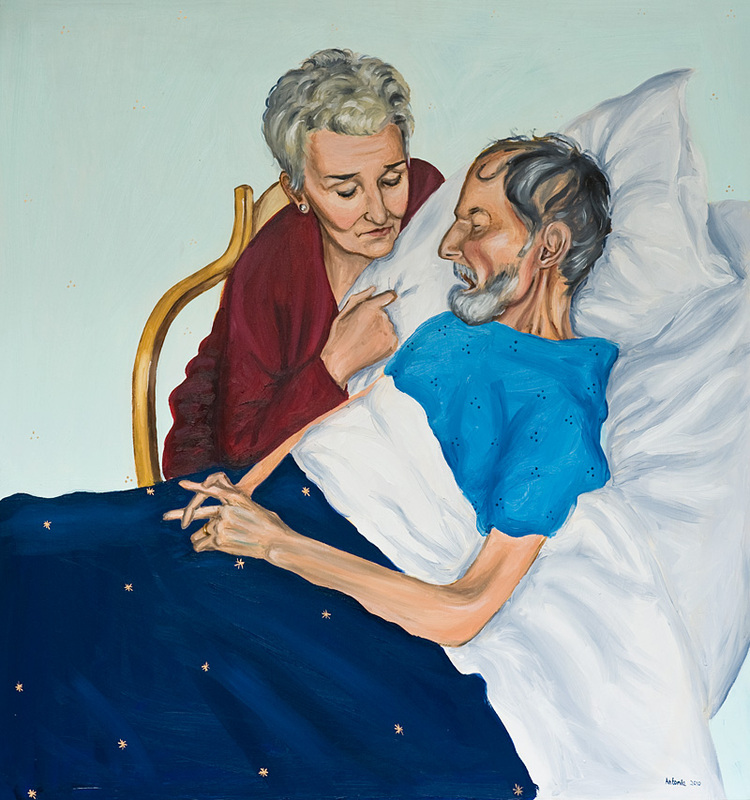 There are also two cancer sufferers, both of whom are gloriously articulate, joining the exhibition. I hope to be arranging an AGD exhibition and Soul Midwife event in Bridport Devon, in early 2013. I will show the paintings there, and have ideas about the Soul Midwife part of it. See below. I may need reigning in. 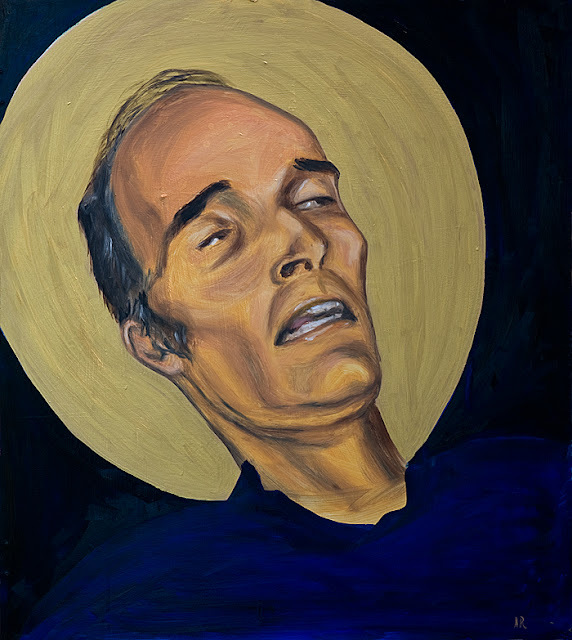 A Graceful Death needs one more painting about Steve from me. It needs a final painting to close the whole story. I don't know what I will do yet, something will come. I want to do something about his funeral, which was perhaps the worst thing about his death. I want to do something to lay that experience to rest, and face that particular ghost. It makes me uneasy to think about it, but it has to be done. I will have to sit in my studio and call out politely to my Genius that I am here, sitting, ready, any time now will do for an idea, thank you very much, please and thank you. Angels. I am painting Angels for Christmas, some very lucky people are going to receive some personal Angels commissioned for them by loving friends and family. I say lucky people, not because they are going to receive an Antonia Rolls painting though of course, that could be a very nice thing. They are lucky because someone has thought of them in such a lovely way, and taken the trouble to commission a painting that they may keep, just for them. I like my clients. I think they are very kind people. I went to London yesterday to help Felicity Warner to run a master class on Soul Midwifery. It was lovely to see her again, and some old friends were there too. Bex, my wonder woman, wise lady, Soul Midwife and now Director of the charity Rainbow's End was there as was Nigel, clever, compassionate and wise community palliative care nurse and Soul Midwife Nigel. The whole day was enlightening, and Felicity and I did a question and answer interview kind of thing, where she spoke of all sorts of angles and aspects of her work. It worked very well, but of course I wanted to keep talking and not stick to my questions. I wanted to carry on when it was finished, because it seemed to me, that there was at least 14 hours more of talking to do. However, I bow to Felicity and agree that one hour was enough. We may still be there, if I had my way. Lock us all in, I may have said to the staff who came to lock up the building at closing time, they may all look tired but I have not finished with them yet. I have more to say, and more to ask Felicity, sit up and pay attention, this is for your own good. You know you want to. Perhaps Felicity will do that with me in Bridport, for the AGD exhibition and Soul Midwife event I want to produce there. It is possible though that she will organise that part of the proceedings, as this may have alerted her. Not 14 hours, she will say sternly. Not even if you provide chocolate and cocoa every hour on the hour. You can have a normal amount of hours and if you don't stop asking me questions and interviewing me I will put a paper bag over your head. That will be your signal to stop. I have found my lovely Age UK lady who I visited. She went into hospital, and it became confused as to where she was and whether she could receive visits. I have missed her, she is fun, witty and very beautiful. I went to see her this week at last, and she has been very ill. I am going to see her again today, and will take her something lovely to look at. She is not feeling very good, but is being wonderfully cared for by her family. I wish I could make her feel better, it must be dreadful to be ill when you are old. She is much recovered though, I am told, and so I hope she continues to progress. The rain has stopped and the blankets have made me warm and sleepy. But up I must get, and go and visit my lovely Age UK lady. I think my Muse has a hand in other things than painting. I think my Muse has stopped the rain in order that I have absolutely no excuse to stay sitting wrapped in spotty blankets on my sofa by the radiator. No excuse at all. My Muse is also arranging for my car to start first time and for the traffic to be non existent so I had better get myself up and on my way. Thank you very much, please, and thank you. Yesterday, a man from the Spectator called me. My first thought was that they had read the death-by-Spectator bit in my past blogs, and that when the Spectator arrives on a Friday I close my eyes and put it into the wicker basket next to my sofa. It is nothing to do with the Spectator, it is only that I don't get round to reading it as it arrives, and they pile up, one after another, looming at me, until I have to take a week off to read them. My first thought was then, when I answered the phone to a man who introduced himself as Phil from the Spectator, that they knew. There was going to be some kind of show down. Actually, Phil only wanted to tell me that unless I paid up immediately, my subscription would end within the next two weeks. The sup plot was, what would I do then? Oh Phil, I could have said, I would sleep at nights! I embrace you, Phil, for only sending me two more weeks of this magazine. In the coming year, Phil, I will read the whole of the past year, which is all I ask, and then, next year, Phil, when you are checking the Christmas subscriptions, come back to me and I will be a different person. Dear Phil, send me those last two Spectators, and then let me rest. I must just add here that it is a gift from one of my admirable brothers, that I have had a subscription to the Spectator these past few years. What I actually said to Phil from the Spectator was that my dear brother deals with all my subscriptions, and I left him to think that I had many subscriptions, and that I could not only handle them all, but I was blase about them. This week in Bognor has been quiet and good. I have needed to be quiet. I have some thinking to do. There are some changes to the A Graceful Death exhibition which I feel need to be made. At present there are 48 paintings and poetry, a book, music, poetry workshops, a film, a prayer bowl and much writing including an amusing and provocative essay by my dear friend and writer Olivia Fane . The paintings continue too, I am presently working on new paintings and new people to the exhibition; new images new stories, new lives, new deaths. It is getting very large, and I feel that it is changing. So what do I do, and in which direction will I take in order for it to be effective? A Graceful Death started with my story. I began the whole thing by painting Steve as he died, and after his death. That is the introduction. It is now utterly about other people and how they face the prospect of illness and death, it is not about me at all. Many who I have painted for the exhibition are no longer alive. But their stories and their images are, and they all contribute to a discussion on what it means to die. A great deal of good is done by this, and much saying of things unsaid takes place when people see the exhibition and read what is written by those who have been painted. One of the problems that I am facing is that it is becoming increasingly difficult to transport all of these paintings and everything that goes with the A Graceful Death. My car isn't big enough, and what worked for a smaller exhibition does not work for a larger one. Transportation and protection of the works is a big issue now; how to best and most efficiently wrap the paintings so that they don't get damaged in transit? Bubble wrap used to work but now it just gets in the way. And the largest of the paintings is about 5' x 4', so now that there are 47 other paintings and poems of varying sizes, plus all the other things, I need a new plan. Another issue is that it is ever growing in size. 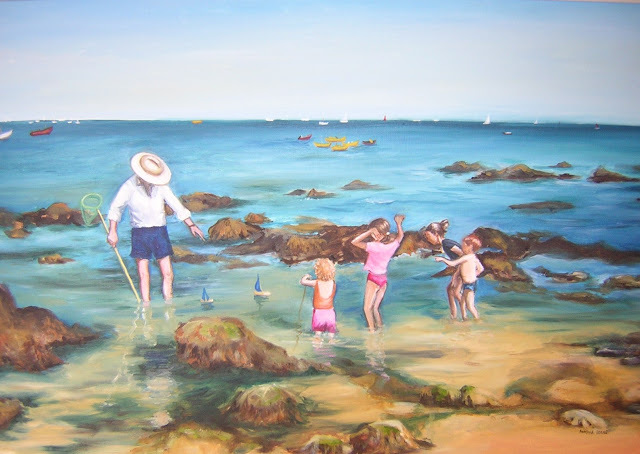 More people are being painted, so that it feels that perhaps I should show the exhibition in two halves. Or with just a selection of the paintings, and a catalogue available to show all of them. Another addition to the exhibition is that I am beginning to use video, thanks to the work of photographer extraordinaire and friend Eileen Rafferty, who is already the official AGD photographer. 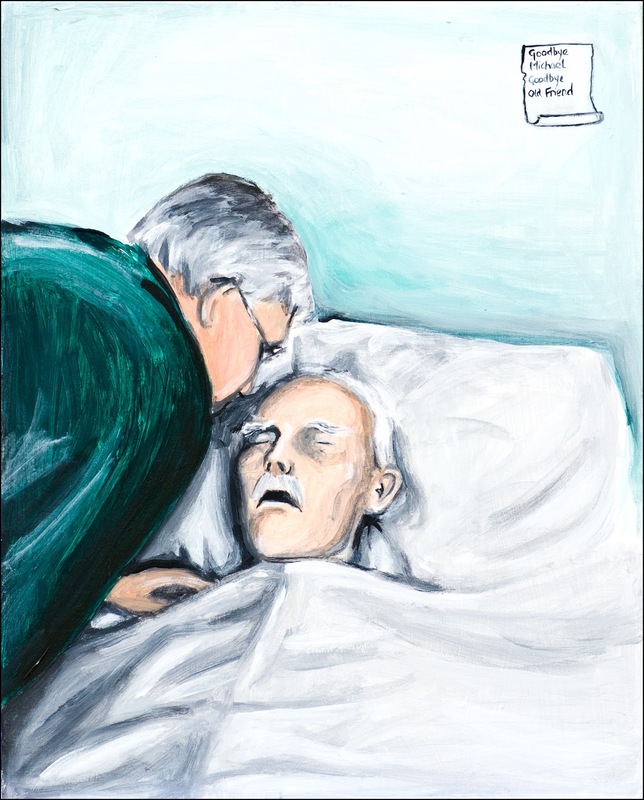 I am also thinking of using drama as part of the exhibition, I want to use some plays and scripts written for the end of life by various writers, because I think it would encourage excellent discussions with people who come to take part. But, the biggest problem now, is the funding. What funding? Here is a bit on the funding. I paint people for the exhibition, keep the paintings, and Eileen presents the sitter with a top quality print of the painting. Nothing goes on display without the consent of the sitter, or the sitter's family. Working with someone on a painting is a labour of love, and the experience for all us involved is profound, moving, enlightening and wonderful. And sad, too, when that person dies if that is what they do. Some of the people in the exhibition are alive and well, some are not. But because of the nature of A Graceful Death, I do not charge anyone anything. It feels as if I am receiving a priceless gift listening to life stories and painting portraits. So how does the exhibition manage to exist, grow, exhibit, make itself? Miracles. It runs on miracles. If I take the exhibition to a conference, or an event that I am not organising, then I charge a fee. But to create the exhibition, I do not. And now I must find a way to fund the creation and maintenance of this amazing work. It is time for it to make its way in the world so that I can concentrate on the paintings and the work I do with the people involved in making it so powerful. It is time to get financial. This then, is why I needed to be quiet in Bognor this week. I must do some serious thinking, it is time to take this huge, growing, glorious exhibition to the next level. It is time to find that open door, and step through it. It is time for benefactors to vie with each other, falling over each other to offer their services, in order that I can keep this exhibition serving the people that take part, and that come to experience it. And as if to help me to do this, I have planned to do nothing at all this weekend. I have planned to wear my pyjamas from Friday night until Monday morning, and to follow my every (legal) whim. If I wish to eat eggy toast at 2am, I shall. If I wish to lie on the sofa under soft green woollen blankets and dream of the future, I shall. If I wish to watch my phone ring, and not answer it unless it is from the Spectator wanting to give me an award for perseverance, that is what I shall do. It is time for a very emotionally mature and ridiculously wealthy philanthropist to decide to go on a journey of personal discovery. Go to Bognor, the Philanthropist's assistant will say, I have had a dream. And so, leaving the limo behind, giving the helicopter pilot the day off, the Philanthropist will catch the train to Bognor. Where, the Philanthropist will ask at Bognor Regis station, is the house in which a lady lies dreaming on the sofa under a green woollen blanket? Where is the house in which a lady is eating eggy toast in the wee small hours, as I must go there; my assistant has had a dream, and my assistant is never wrong. Ah, someone will say, you will want the house of A Graceful Death. I am intrigued! The Philanthropist will say with feeling. I feel a journey of personal discovery coming on! I will go and accompany this lady (when she gets dressed and answers her phone) and I will meet people and hear things that will make me wonder at the miracle of life and death. I will go with her and see how people tell the truth at the end of life, and how it is sometimes the hardest and sometimes the most intensely rewarding part of one's life. I will be prepared to be humble and to listen, and I will see how Art can reach the parts other things can't reach. And most of all, I will pay for everything. It will not take much for me, the Philanthropist on a journey of personal discovery, compared to what I will experience and learn from being with those who are dying, what are a few noughts on a cheque compared to that? Quite, I shall say when I hear the Philanthropist knock. Quite. All I ask, I shall say as I put the kettle on and wrap the Philanthropist in a warm pink and white spotty blanket for warmth, is that you come with me, see what I see, and make it all possible. I do not need more than you can give, but come with me and see how this is all done. Listen to the music that Lizzie has composed for the exhibition. Meet the lady who is going to be painted next and listen to her story. Meet her friend who loves her, and see how life gives us so much that passes under our noses until we are in need of someone to hold us as we face our dying. And see, how we can ask someone who is dying - Who are you? What are you saying to us? Sit with me while I paint it, and tell me what you are feeling. And the Philanthropist will say, well blow me down. This is profound and within my grasp and all that. But first things first. Can I have ketchup on my eggy toast? Goodbye Michael, Goodbye Old Friend.